I know I promised this post last Friday, but life is hectic. What can I say? 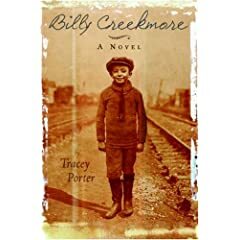 I recently finished reading Billy Creekmore by Tracey Porter. This novel reminded me of the brother book to Counting on Grace by Elizabeth Winthrop. The story is quite similar, because of the underlying theme of child labor in the early 1900s. Although, this book has its own unique style and story. Young Billy Creekmore, the main character, goes through so many twists and turns during the story it is hard to tell whether to laugh, cry, or be frightened. Creekmore begins his life journey in an orphanage awaiting his day to begin working in the local glass factory. When a young friend returns disfigured from the terrible working conditions in the factory, Creekmore is determined to escape the same fate. Luckily he is quickly plucked from the orphanage by a long lost aunt and uncle. (See how the story flips your emotions so quickly.) Next Billy eagerly dives into the world of mine work, something his aunt and uncle are not truly in favor of him trying. Next thing you know, that career is cut short by terrible mine accidents and union arguments. (I am completely understating that part, but I don't want to give it away.) Creekmore suddenly is swept into the world of circus work. OH MY GOSH, I am telling WAY TOO MUCH! The book was wonderful for its historical fiction. I love the fact that I could recommend it to a boy who may be leery of Counting on Grace, because of its girl main character. I felt as though I got more into Counting of Grace, but this not an admittance of anything, necessarily. I really felt the power of the story. I did not however, feel that I connected with the main character the same way I connected with Grace. Something I am dying to know more about is the relationship with Billy and a woman from the orphanage. (forgot her name, sorry) I just really think she had more to do with the finding of the mysterious "aunt and uncle." I would love to ask the author more about this part of the novel. Will Billy's life turn out blissful or sorrowful, will he ever find his father, will find his own life's joy? You must read to find out!